Ecpa Reform stories at Techdirt. stories filed under: "ecpa reform"
Unfortunately, as we noted at the end of July, the judge in the case, Loretta Preska, sided with the DOJ. Both parties share the common goal of permitting the Court of Appeals to hear this case as soon as possible. Their disagreement concerns the correct path to that goal. In order words, the parties agree on the destination but the route to get there is the subject of hot dispute. Basically, this was a very minor move to push things onto the proper legal track to get this case before the appeals court. Because the original order isn't technically appealable, the stay didn't make any sense, so the Judge removed it, with everyone knowing that Microsoft won't hand over the info, leading the Judge to issue a different ruling that can be appealed. I saw the news on Friday and realized it wasn't worth writing about, because it's basically nothing. Let there be no doubt that Microsoft's actions in this controversial case are customer-centric. The firm isn't just standing up to the US government on moral principles. It's now defying a federal court order. They did this, even though in the very next paragraph the Microsoft statement itself points out that this is nothing more than a procedural issue. Unfortunately, sites like Slashdot also picked up on the WindowsITPro story and repeated the misleading headline. Yes, Microsoft is trying to protect its customers' email data (held in Ireland) in this case. And yes, it's an important case. But Microsoft (and a variety of other tech companies that filed amicus briefs in support of Microsoft's position) took that stand months ago. What happened on Friday was a minor procedural effort to move the case along, and didn't represent any big new "heroic" move by Microsoft to "defy" a court order. Nothing to see here, move on. The appeals court is where this case will actually get interesting. For years, we've written about the third party doctrine and its troubling implications for the 4th Amendment and your privacy -- especially in the digital era. If you're unfamiliar with it, the third party doctrine is the concept used by law enforcement (and, tragically, the courts) to say that you have no expectation of privacy or 4th Amendment rights in information you've given to a third party. The origins of this argument are not completely crazy, because there is a legitimate claim to the idea that if I entrust you with some private information, and you decide to disclose it, that my 4th Amendment rights haven't been violated. But that assumes a very different world. In today's digital world -- especially with cloud computing -- we "entrust" all sorts of information to third parties even though we still think of and treat that information like it's our own personal effects. These aren't cases in which I'm handing over a collection of journals to my neighbor to hold onto. Online services are treated as our own content -- which we can access, update and modify at any time from any device. While the Supreme Court's recent decision in the Riley/Wurie cases suggests that it is becoming increasingly uncomfortable with law enforcement twisting old concepts onto new technologies to eviscerate privacy, the third party doctrine technically still stands -- and there has been little real discussion of it in Congress. Some will still argue that by sharing data freely with Facebook, Google, Mint, Uber, Twitter, Fitbit, or Instagram, Americans are choosing to make that data public. But that is simply not the case. I might not have any expectation of privacy when I post a handsome new profile picture on Facebook, or when I send out a tweet to tell people I’ll be at the Tech Northwest conference. But when I send an email to my wife, or store a document in the cloud so I can review it later, my service provider and I have an agreement that my information will stay private. Neither of us have invited the government to have a peek. Basically, I think sharing this information with Google is like putting property in a safety deposit box, but the government thinks I’m posting it on a billboard out on I-5. Citizens have agreed to a contract with Google or Mint that keeps their email or financial data private. In many cases these companies don’t even know what information they’re holding for you. Making information available to a service provider for a limited business purpose - so that they can give you a new app, or provide targeted ads, or do any other kind of business with you - is simply not the same as broadcasting that information to the public. In the view of the law this data should be as secure to your person as if it were sitting in a locked filing cabinet in your home office. So how about fixing it? Well, he says, it needs to start by reforming the laws that cover the intelligence community, preventing them from bulk collection of the data you've handed to third parties. I believe that any serious effort to reform this law needs to end the bulk collection of Americans’ personal information, starting with their phone records. I have been challenging this program for years on the grounds that isn’t just harmless old metadata. Furthermore, I believe that Congress needs to reform the Foreign Intelligence Surveillance Court, to make it more transparent and to include an advocate for the American people. Additionally, there needs to be much greater transparency from intelligence agencies about the scale and scope of domestic surveillance activities, and private companies should be given the ability to disclose much more information about requests they receive from the government. Most of all, Congress must close the loophole that intelligence agencies are currently using to read a significant number of Americans’ communications without a warrant. The next step will be to seriously examine collection that is done overseas. When the Foreign Intelligence Surveillance Act was written in the late 1970s, it was written to only apply to collection done inside the United States. But that was back in an era when each country essentially had its own separate communications infrastructure. Now those separate systems have been replaced by an integrated global communications network, in which calls and emails within one country might be routed through multiple different countries. When you combine that shift with new technology that makes it much easier to obtain large amounts of data, it no longer makes sense to assume that collection done overseas will not sweep up the communications of large numbers of law-abiding Americans. This means that the rules that govern collection overseas will need to be substantially revised. These are governed by something called Executive Order twelve-triple-three, which is more than 30 years old and predates this sea-change in global communications. I was encouraged a few weeks ago when the Senate Intelligence Committee recognized this fact, and voted to advance a bill that would begin to establish some firmer rules in this area. Finally, he talks about the need for ECPA reform -- another thing we've been discussing for years. ECPA is the 1986 Electronic Communications Privacy Act which is so woefully out-of-date, it's not even funny. It's the one that assumes if any communication is sitting on a server for more than 180 days, then it's "abandoned." Go look at how many emails in your Gmail account are over 180 days old... Even though more than half of the House is co-sponsoring an ECPA reform bill, law enforcement folks are protesting it, because they like the easy access. The DOJ loves to go on fishing expeditions with ECPA, as does the SEC and the IRS. Wyden says it's time for real reform. There's much more that can be done, some of which he refers to in his speech, but it would be nice if Congress finally realized just how truly dangerous the third party doctrine is to our privacy. Can Senator Leahy Actually Get Anything Done To Help With Civil Liberties And Innovation? Senator Patrick Leahy is often considered one of the most powerful Senators. He's the most senior Senator, third in the presidential line of succession (after the VP and the Speaker of the House) and the head of the powerful Senate Judiciary Committee. He's often presented as a "friend" to both the technology and civil liberties communities -- even though many in both of those communities still view him skeptically for his all out support for dangerous copyright legislation in the PROTECT IP Act (PIPA), which would have seriously messed with the underlying DNS structure of the internet. Even so, on a variety of other issues, including NSA reform, ECPA reform and patent reform, he's often been seen as leading the charge. But over and over again, it seems that charge is... to go nowhere. Politico has a story about how last week was a disaster for the tech industry in Washington DC. For all the talk about how Silicon Valley has been flexing its lobbying power, patent reform was killed, a good NSA reform bill was replaced with a bad one (leading the tech industry to pull its support) and the fight for immigration reform went the way it normally does -- nowhere beyond people yelling at each other. But what I found even more interesting is just how powerless the "powerful" Senator seems to be on so many of these issues. Leahy has been the leading Senate voice for ECPA reform (requiring a warrant to search your electronic data) for years -- and it has pretty widespread support. And yet, he's unable to get it to move forward because the the SEC and IRS want to be able to read emails without a warrant. Really? Similarly, for over a decade, Leahy has been the point person on patent reform in the Senate, promising to finally reform the system to stop abusive patents. The bill he finally got through in 2011 did absolutely nothing after it was watered down and watered down and watered down some more. And this year, when it looked like there might finally be a bill with at least a little (not nearly enough) progress towards stifling abusive patent practices, he got completely shut down by the trial lawyers and Harry Reid. And, now we're basically relying on Senator Leahy to fix the NSA reform package. He introduced the companion to the USA Freedom Act in the Senate, and many in the tech and civil liberties communities are hopeful that Leahy will stand firm in actually reforming the NSA. And while he's been saying all the right things about reforming the NSA, given his track record, you have to start to wonder: can this super powerful Senator actually get this done right? Yes, getting anything done in Congress is a pretty difficult process these days (perhaps for good reason). But we keep hearing about how Senator Leahy is so powerful and such a friend to innovation and civil liberties. But over the past few years, it's been a lot of tough talk, and nothing ever seems to actually get done. It really begins to make you wonder if he's such a "friend" to these communities after all. Back in December, we wrote about the effort to push for ECPA reform by noting that one of the main government agencies fighting against it was the SEC, which wanted the ability to snoop through your emails without getting a warrant. If you don't remember, ECPA is an excessively outdated law from 1986, whose definitions make no sense in the internet era (especially one with cloud computing). The key example often given is that emails on a server that are over 180 days old are considered "abandoned" and thus no warrant is needed to access them. That may have kind of made sense in an era when people downloaded all of their email, but now that nearly all email remains on servers somewhere it makes no sense at all. There are other problems with ECPA similar in nature (opened vs. unopened emails are treated differently, for example), but it's clear the law is outdated. Two stories popped up last week that raise serious concerns about the way that the SEC tramples on the Constitution. The first is that in a hearing, SEC boss Mary Jo White was asked why the SEC is so resistant to ECPA reform and what's wrong with getting a warrant, and more or less admitted that it's standard practice for the SEC to not get a warrant, but to rely on loopholes in ECPA to get access to emails. Prior to this, many had assumed that this was just a desire of the SEC, not that they were regularly doing it. But White's answer makes it clear that the SEC views this practice -- which seems like it should be a clear 4th Amendment violations -- as standard operating procedure. While she insists that the privacy issues aren't a huge deal, because the SEC tries to "give notice" to the subscriber whose email is being accessed, that still doesn't explain why paper documents require a warrant, and yet the SEC doesn't bother with the much higher standard (including judicial review) of a warrant for electronic documents. In a criminal trial, the federal government has long been obliged to promptly turn over to the defense any evidence that could show that the accused did not commit the offense of which he is accused. The Brady rule (announced in the 1963 Supreme Court case, Brady v. Maryland), prevents one-sided prosecutions in which the defendant is kept in the dark about information that might show that he is innocent. The government's job as criminal prosecutor is not to obtain convictions, but "to do justice," according to the traditional legal maxim. It should be required to follow the Brady rule in civil trials as well. But the SEC does not, even when it accuses a citizen of fraud. Had the agency complied with this simple rule in its recent insider-trading case against one of us, Mark Cuban, it is unlikely that a lawsuit would even have been filed, let alone go to trial. At issue were notes the SEC had concerning the details of Cuban's conversation with the CEO of Mamma.com, the search engine Cuban had invested in (and then sold all his shares in), which showed that, contrary to the SEC's claims in the case against him, Cuban had never made certain promises. When Cuban and his lawyer asked for these notes, the SEC resisted. The SEC, however, resisted the disclosure of these notes for the next three years. Even up until the time Mr. Cuban took the stand, the SEC continued to fight to keep the notes from being shown to the jury by asking the judge to exclude them from evidence. Fortunately, the judge disagreed and the jury ultimately cleared Mr. Cuban of a charge of insider trading. So, reading both of these stories, we see that the SEC feels that it is free to ignore both the 4th Amendment (against search and seizure without a warrant) and the 14th Amendment (concerning due process). Don't we think that agencies of the federal government should be required to follow the Constitution -- especially basic concepts like protecting the privacy of individuals and giving them basic due process? And, for those of you who think this is no big deal, because it's the SEC, and the SEC just goes after big bad bankers and the like, recognize that the agency following right behind the SEC in fighting ECPA reform is the IRS. Do you feel it's similarly okay for the IRS to search your emails and electronic records without a warrant while also believing that it need not share any of the exculpatory evidence it finds, proving your innocence, while bringing a case against you for violating the law? Oh, and just for the hell of it, let's take this a step further. Just a few weeks ago, the NY Times reported on an increasingly popular tactic of law enforcement to effectively use the SEC to trick people into effectively implicating themselves in criminal cases. It tells the story of a low-level guy who worked at a law firm, and was asked by the SEC to "help out" with an investigation. Only at the last minute, was it mentioned that someone from the district attorney's office would be present -- and at no time was there any indication that the guy was being investigated for criminal behavior. But thanks to the SEC smokescreen, the guy was indicted, and he's still not sure why. So, now it's an SEC that ignores the Constitution, searches emails without a warrant, hides exculpatory evidence and surreptitiously uses these "investigations" to help build out criminal charges against people on a highly questionable basis. See the problem, yet? The folks over at VanishingRights.com are fighting to reform ECPA, which would at least solve half of the problem above. Right now, the SEC and the IRS remain the main government agencies aligned against such reform. It's time to tell those agencies that they need to obey the Constitution too. We've written a few times recently about the importance of ECPA reform, to bring a woefully out of date law into the 21st century. 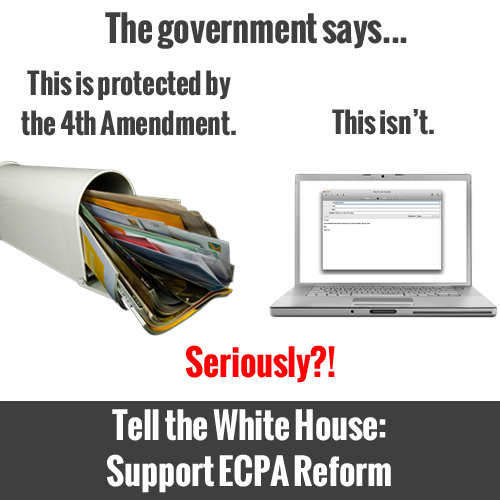 Specifically, we've urged people to sign this White House petition in favor of ECPA reform. That petition closes soon, and it's still a bit short of the 100,00 goal. Why is this important to you? Because, without it, it's much easier for the government to snoop on your emails without a warrant. What people want is for emails and regular mail to be treated the same, which is simply not the case today. While this is a separate issue from the NSA stuff, it does matter quite a bit, and this is a chance for there to be a real win that helps protect your privacy. Fighting against this proposal are a variety of government agencies, led by the IRS and the SEC, which have made good use of this loophole to read emails without getting a warrant. This is not what the law was intended for at all. It's a loophole based on the outdated law, which was written in 1986, before anyone could comprehend things like web-based email. The IRS and SEC like having this loophole, and they don't want it to go away. In fact, they want it to be made explicit, rather than an accidental loophole of history. That should be a massive affront to folks who believe in the 4th Amendment and the basic concept that a search should require a warrant based upon probable cause. Yes, it's true that the White House has ignored certain petitions in the past. It's also true that there are certain issues where the White House doesn't really seem to care what people have to say, it's made up its mind. But, that is not always the case, and the White House has used these petitions to take strong positions in the past -- including on things like SOPA and mobile phone unlocking. When accompanied by a strong campaign beyond just the petition, the White House seems open to taking certain issues more seriously. This is one of those. By all indications, there are some in the White House who agree that ECPA is out of date and needs to be fixed. There appears to be an internal debate about where the official White House position will be -- whether it's siding with the IRS and SEC -- or with the 4th Amendment rights of the public. Having a ton of signatures from the American public on their side will absolutely help those in the White House who support real and meaningful ECPA reform push back against the agencies. This isn't an empty gesture. There are bills in the House and Senate to fix ECPA, close the loopholes and protect your 4th Amendment rights. Getting White House support could finally push those bills over the edge and make them law. Sticking with the cynical approach and refusing to sign guarantees failure. Not signing works to the advantage of the IRS and SEC and others who like using this loophole. Even if you're cynical about this, signing the petition at least gives it a chance to influence the debate. And, yes, I know that outside of the general debate over ECPA, people will look at the NSA situation and argue that it doesn't really matter what the law says. That's not true. Yes, the NSA issue is a big one that needs to be dealt with, but this is about a loophole that goes way beyond the NSA, and is used and abused by different government and law enforcement agencies. Here's a real chance to push back on that and to score a real victory for privacy. Letting cynicism and apathy dictate your move here guarantees that the forces pushing against your 4th Amendment rights win. So take a chance and sign the petition.